Quanti-Blue™ powder is temporarily out of stock. 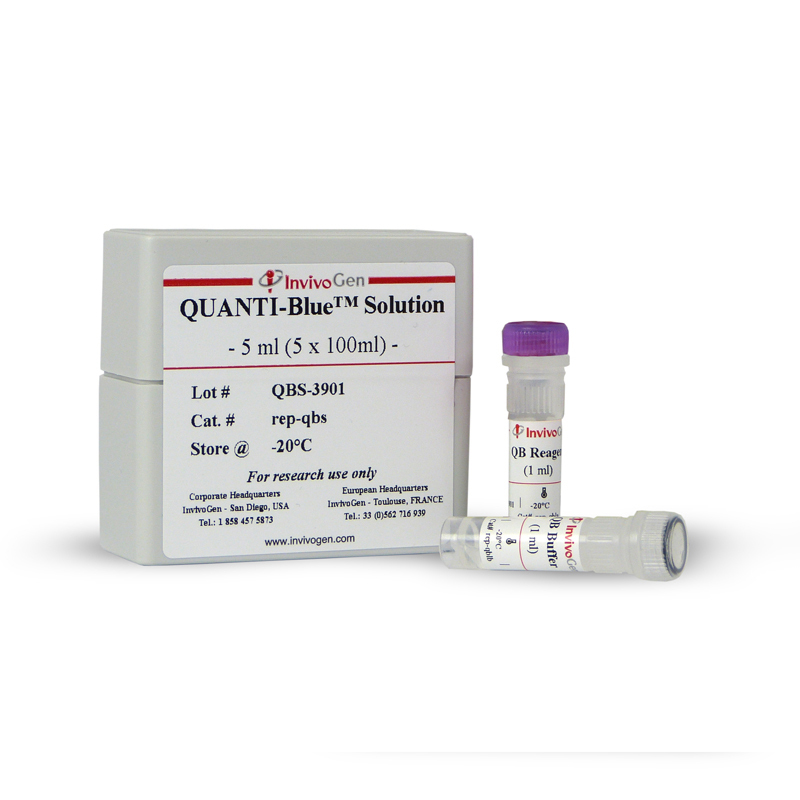 We highly recommend Quanti-Blue™ solution as the alternate product. 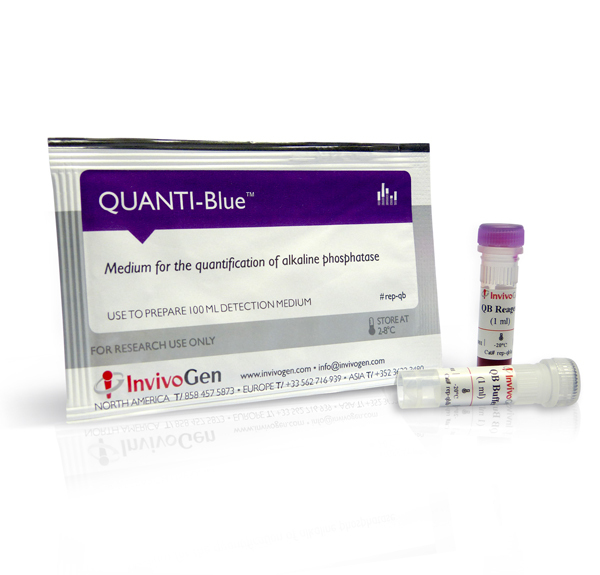 QUANTI-Blue™ is a colorimetric enzyme assay developed to determine any alkaline phosphatase (AP) activity in a biological sample, such as cell culture supernatant. InvivoGen provides a wide collection of reporter cell lines with the secreted embryonic alkaline phosphatase (SEAP) reporter gene encoding a truncated form of placental AP. SEAP secretion in cell culture supernatant presents multiple advantages over intracellular reporters. QUANTI-Blue™ Solution is a liquid formulation of QUANTI-Blue™ Powder offering a convenient, easy and rapid means to detect and quantify SEAP and AP activity. In the presence of AP, the color of QUANTI-Blue™ changes from pink to purple/blue. The purple/blue color intensity reflects the activity of AP. The levels of AP can be determined qualitatively with the naked eye or quantitatively using a spectrophotometer at 620-655 nm. Functional characterization: cellular assays using alkaline phosphatase of SEAP-expressing reporter cells. rep-qbs : 5 x 1 ml of QB reagent + 5 x 1 ml QB buffer, sufficient to prepare 500 ml of QUANTI-Blue™. rep-qbs2 : 10 x 1 ml of QB reagent + 10 x 1 ml QB buffer, sufficient to prepare 1 liter of QUANTI-Blue™. Store QB reagent and QB buffer at -20°C. Reconstituted QUANTI-Blue™ Solution is stable for 2 weeks at 2-8 °C and for 2 months at -20°C. Keep reconstituted QUANTI-Blue™ away from light. rep-qb1: 5 pouches (5 x 100 ml). rep-qb2: 10 pouches (10 x 100 ml). Each pouch allows the preparation of 100 ml of QUANTI-Blue™. QUANTI-Blue™ is shipped at room temperature. Store QUANTI-Blue™ pouches at 2-8°C. Reconstituted QUANTI-Blue™ medium is stable for 2 weeks at 2-8 °C and for 2 months at -20°C. Keep reconstituted QUANTI-Blue™ away from light. The Synergy between Palmitate and TNF-α for CCL2 Production Is Dependent on the TRIF/IRF3 Pathway: Implications for Metabolic Inflammation. Short single-stranded DNA degradation products augment the activation of Toll-like receptor 9. 2016 BMC Cardiovasc Disord. 16(1):185. Wnt signaling contributes to vascular calcification by induction of matrix metalloproteinases. T cells down-regulate macrophage TNF production by IRAK1-mediated IL-10 expression and control innate hyperinflammation. Inoue M, Arikawa T, Chen YH, Moriwaki Y, Price M, Brown M, Perfect JR, Shinohara ML.